A view of our baby girl's crib, the hand-painted butterflies nursery wall mural in shades of lavender and window treatments. 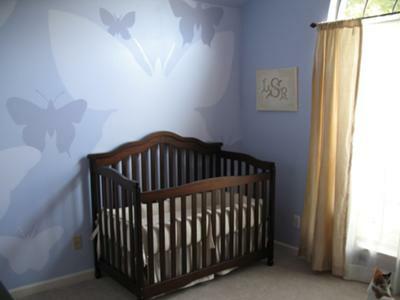 Modern Butterflies theme nursery wall painted in shades of blue for our baby girl, Lily. When I would daydream of decorating Lily's nursery, I knew I wanted to do butterflies theme for our baby girl, but in an untraditional way. I had seen a nursery on HGTV's television program "Rate My Space" that included a graphic alphabet mural on the wall painted using several tones of the same paint color. I was not drawn to the concept of an ABC's theme but I adapted their ideas using the butterflies that I had dreamed of. Once the theme of the project was determined I had to choose colors that I liked that would work for a butterfly's wings. 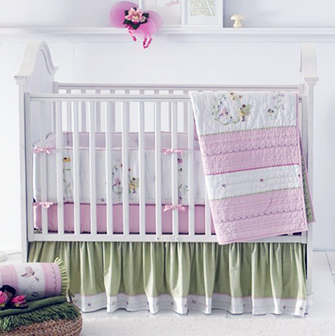 ideas for a nursery decorated with butterflies including fairies and forest animals. I had to conduct some research and become acquainted with the process of painting the butterfly wall mural. The thought of undertaking such a large, detailed design was pretty intimidating at first as I had never done anything like it before. 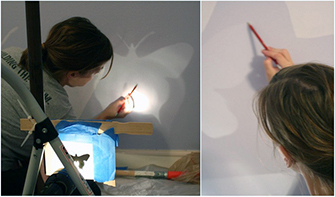 Since I am not trained as an artist, I used a projector to light the images of butterflies onto the wall. 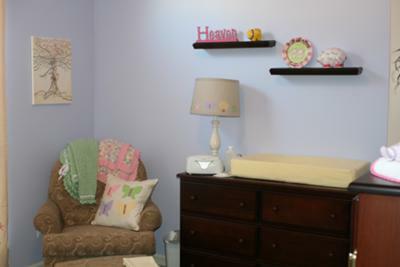 Once I had them positioned and in place, I traced the outlines and then painted in the colors which determined the ultimate color scheme of the nursery, lavender and pale yellow. I ordered a plain set of butterfly baby bedding and then personalized it with appliques including trees, flowers and butterflies. I then used the same appliquéd shapes that I had used for the crib set on the nursery curtains and the lamp shade and bought an area rug from Land of Nod. I made much of the nursery wall art myself. I painted the monogrammed artwork with Lily's initials in colors to match the room's color scheme and I did a tree painting. I painted the tree by squeezing paint out of ziplock baggies to get the squiggly lines. If I had to choose one part of the room that I love best it would have to be the effect of the butterfly mural with the hand-painted artwork coming in as a close second choice. Posting these pictures made me realize how very much I miss this room! We lad to leave this house last year and while I love the way their her room has turned out, I definitely miss the features of the room in our old house that we created with love for Lily. To see more pictures, you can visit my blog http://johnandcarolshow.blogspot.com/2011/05/our-old-house-lilys-nursery.html. 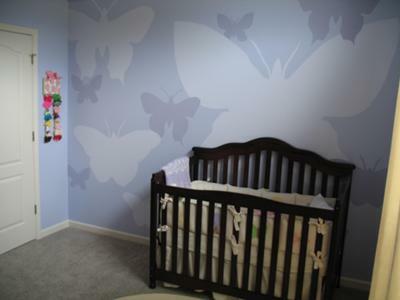 Taking an ABC nursery wall painting technique and applying it to a modern butterfly theme nursery mural took vision! 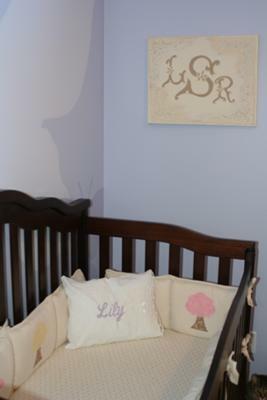 I love the way that you used color to blend Lily's initials, the painted tree and the large butterflies on the wall. 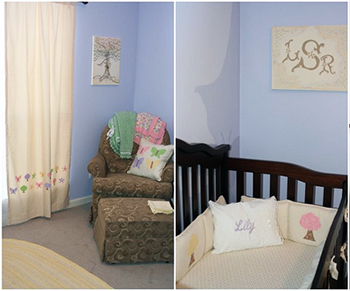 Thanks for sharing pictures of your baby girl's nursery decorated in a butterfly theme with Unique Baby Gear Ideas. I get the feeling that all of the rooms in your new home are just as amazing as this one that you had to leave behind. I love how elegant this room is, and how you've created a precious nursery that will transition well from a baby's room to a little girl's room to a teenager's room. It's feminine without being full of bubblegum pink and flowers. The wall mural is my favorite. What a beautiful, peaceful focal point! Excellent job! This is beautiful. I love it! That is really cool! Love it! I LOVE this nursery. That is such a cute idea. I'm in love with the butterfly wall! Butterflies are such a popular theme for nurseries, but the wall that this mom designed makes this nursery anything but common! I also really like that there are a variety of butterfly shapes, not the same one projected over and over again. Great job!